The Pirates picked up four out of six possible points this week. 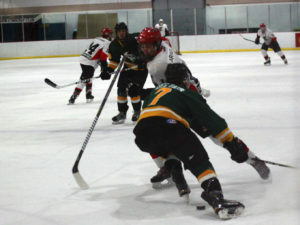 Facing the Amherstview Jets last Thursday, the Pirates exploded for five goals in the first period en route to a 7–3 win. A stinging 6–1 loss to Napanee the next night was followed up by 9–1 rout of the Gananoque Islanders on Sunday night. “Any time you play three games in four nights, if you can take four of those points I think it’s a pretty successful weekend,” said Pirates general manager Chris Masterson. With 11 games left in their regular season, the Pirates remain in third place in the PJHL’s Tod Division with 39 points, just one point back of Port Hope. The Napanee Raiders maintain their firm grasp on first place with 53 points — 13 points ahead of the Panthers — after 28 games. The Pirates looked as if they’d been fired from a cannon to open Thursday’s contest against the Jets. The first goal of the contest came just under five minutes in as the puck squirted free from a battle in the corner, bouncing into the slot to a waiting Jordon Cannons who one-timed it home. Justin Arnold and Nate Boomhower had the assists. The goal generated a lot of momentum for Picton and, eventually, their work led to a hooking call on Amherstview’s Wyatt Crampton. On the ensuing man advantage, Matthew Scott fed a pass to Nate Boomhower who had set up inside the top of the circle. The one-timed shot glanced off the post before hitting the back of the net, putting Picton up by two at the 8:04 mark of the frame. Noah Brant also picked up an assist on the play. Cannons collected his second of the period at 11:55 when he shovelled the puck over sprawling Jets goaltender Keegan Paulette during a scramble in the crease. Picton made it 4–0 just over two minutes later when Brant fed a pass to Jaydon Wood. All alone in the slot, Wood deked to the backhand and tucked the puck behind Paulette. The fifth goal of the opening frame came as Cannons drove to the net and sent a backhand reverse to Brant in the slot for a tap in. Devin Morrison also picked up an assist on the play. While the Pirates had built up a significant lead in the first period, Masterson said coach Tyler Green felt the team’s play began to wane after the first 20 minutes. “Thankfully the start let us get that victory, but I know (Green) was not happy with the performance overall the rest of the game,” he said. Boomhower added a power-play goal 6:11 into the second to make it 6–0, but the Jets started to build some momentum on the back of some turnovers. 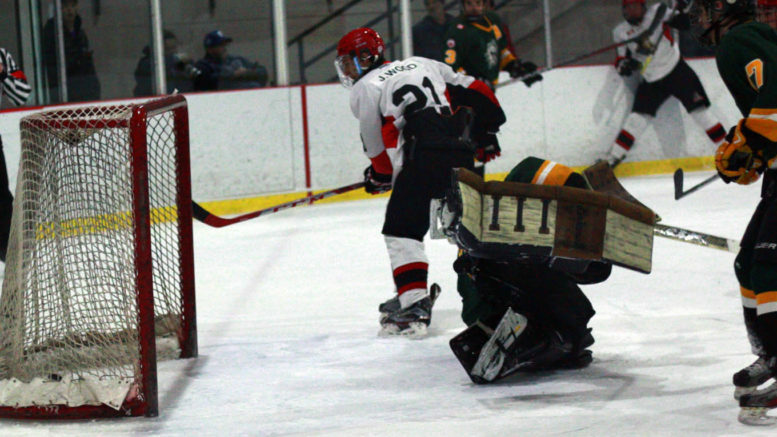 Amherstview’s Joey Mayer scored at 12:43 to make it 6–1 and again three minutes later to cut the lead to four. Brayden Bertrand made it 7–2 under a minute later as the Pirates maintained a big lead heading into the third. The Jets came out of the period with a 20–16 advantage in shots on goal. Both teams had their chances in the third, each firing 14 shots on goal, but the Jets had the lone tally of the frame. Following his unsuccessful penalty shot attempt earlier in the third, Cody Smith found the back of the net at 18:48 of the frame to bring the final score to 7–3. The Pirates had a tough task in the Napanee Raiders on the second half of a back-to-back Friday night. Ryan Casselman put the Raiders in front just 5:18 into the game and Austin Labelle added another at 7:14. Riley Steeves made it 3–0 just over a minute later. Morrison, from Brant, finally got the Pirates on the board midway through the first, but the goal would prove to be Picton’s lone tally of the contest. Devon King and Griffen Conger added goals in the second period and Labelle picked up his second of the game in the third to close out the 6–1 contest. The Raiders held a 34–30 shot advantage overall in the game. Despite the result, Masterson said club brass felt the team had a solid outing versus the Raiders. He said Napanee did a great job of capitalizing on their chances on the strength of some potent offensive talent. Picton’s 9–1 rout of the Islanders on Sunday night got off to a slow start. The Pirates got on the board 14 minutes into the opening frame with Nick Hoey potting a power-play goal from Scott and Cannons to make it 1–0. Just three minutes later it was Gananoque’s Kyle Casford evening the score. The Pirates held a slight shot advantage in the period, but entered the first intermission deadlocked at 1–1. Masterson said the team had a flat start and didn’t play very well in the first frame. Whatever was said in the room, it appeared to work. Just 2:42 into the middle frame, Morrison scored to make it 2–1. Boomhower completed a play from Arnold and Tye Eaton to make it 3–1 at the 9:03 mark. Just 40 seconds later, Tyson Cassidy scored to increase the lead to three. Bertrand and Scott had the assists. Brant made it 5–1 at 13:28 with Nick Kyte assisting and Chase Burden, from Cassidy, scored with less than two minutes remaining in the frame to make it 6–1 heading into the third. The Pirates kept their foot on the gas in the third with Bertrand, Morrison, and Hoey scoring in the first half of the frame. The Islanders didn’t have an answer as the Pirates cruised to victory. Picton takes on Napanee again Thursday night before heading to Amherstview to face the Jets on Sunday evening. Puck drop for both games is 7:30 p.m.
Masterson said the Pirates will have to key on Casselman in Thursday’s faceoff with the Raiders. He said Casselman was a top scorer in the OJHL last season and likely would be again this year had he not chosen to return to Napanee.